IR command processor Tibbit records and plays back infrared commands of conventional IR remote controls. This Tibbit utilizes an FPGA-based circuit for capturing and reproducing IR signals, thus ensuring high timing precision and low signal jitter. Tibbit #26 is based on the iCE5LP1K-SWG36 FPGA from Lattice Semiconductor. A suitable IR receiver and emitter must be connected to this Tibbit. Typically, you would pair this Tibbit with #20 or #21, then attach the IR receiver and emitter using wires. 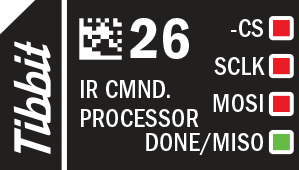 Tibbit #26 can work with a wide variety of IR receivers and transmitters. We have provided some examples of suitable IR front-ends, but the spectrum of receivers and transmitters that will work with this Tibbit is much wider than what's documented here. Note that there is no need to have a current-limiting resistor on the IR OUTPUT. This is a current-regulated output that internally limits the output current to 500mA. The use of this Tibbit is illustrated by a Tibbo BASIC test project. Yo can find it here: https://github.com/tibbotech/CA-Test-Tibbit-26.